The presence of affordable homes nationwide is rapidly decreasing. Throughout the U.S., there are 11.5 million extremely low-income tenants competing for a dwindling stock of 3.2 million affordable homes. For every new affordable home created, two are lost due to deterioration, abandonment, or conversion to more expensive housing. It is also far more cost-effective to rehabilitate existing housing than to construct new housing, and in recent years, Congress has allocated very little funding to build new affordable housing. Thus, the preservation of existing affordable homes is critically important for low-income tenants, since it directly impacts their housing stability, access to employment opportunities, health care, transportation, and education, among other important issues. The structure of federally supported affordable housing multifamily properties creates unique long-term affordability risks because they are privately owned by for-profit and nonprofit owners. These include homes created with federally subsidized mortgages and with project-based rental assistance contracts. Data from the National Housing Preservation Database shows that nearly 1-in-10 publicly supported rental homes are subject to expiring affordability restrictions in the next 5 years. This training series will provide a brief overview of preservation issues that tenants and advocates will encounter nationwide. 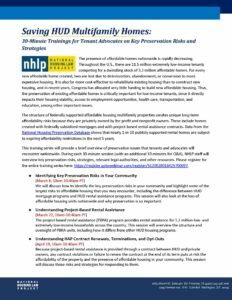 During each 30-minute session (with an additional 10 minutes for Q&A), NHLP staff will overview key preservation risks, strategies, relevant legal authorities, and other resources. affordable housing units nationwide and explain why preservation is so important. Powerpoint slides of this webinar. oversight of PBRA units, including how it differs from other HUD housing programs. identify and respond to them. building conditions in project-based rental assistance properties. resources threatens the preservation of affordable housing.